In this week’s Torah portion, Ki Tisa (Ex. 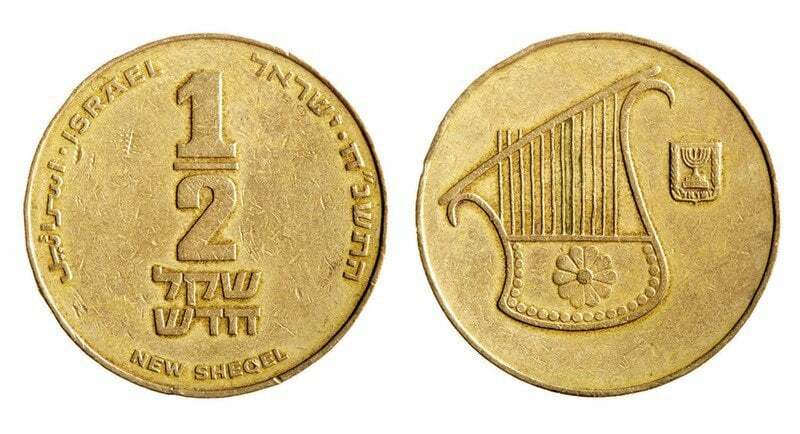 30), Jewish people are given the commandment of donating a coin as atonement, not just a coin – half a coin. But why half? If God thought, twenty gerahs would be too much, He could have commanded Moses to mint another coin worth ten gerahs. But no, the coin was to remain what it was—worth twenty gerahs—and Jews were to give half a coin. Don’t you find it peculiar? I don’t, because half-coins are the favorite metaphor for explaining quantum entanglement. What is entanglement? When obtaining information about one object improves our knowledge of the other object, the two objects are said to be entangled. For example, let us consider two entangled electrons, each in a state of superposition of having their spin up and down (which is analogous to a classical top spinning clockwise and counterclockwise at the same time – in a quantum world this is possible!). If we measure the spin of the first particle, thereby collapsing its wavefunction, and find it to be directed up (this is analogous to rotating counterclockwise), then, immediately, the wavefunction of the second electron is collapsed and, if we measure it, we are liable to find its spin pointing in the opposite direction—down (which is required by the angular momentum conservation law). In other words, if we find out the direction of the spin of one particle, we learn the direction of the spin of another particle – hence the two are entangled. On the first blush, this seems mind-boggling. How could the second electron “find out” about the collapse the wavefunction of the first electron faster than the speed of light allows it (if they are far enough from each other)? How does the signal caring the information travel from the first electron to the second? This is the essence of the EPR paradox after the famous article by Einstein, Podolsky, and Rosen. Einstein had a problem with it calling it “spooky action at a distance.” Actually, there is no signal traveling between the entangled electrons transmitting information between them. And there is no action at a distance, spooky or not. It’s just that learning about one electron reveals information about the other without any information exchange between them. How? Let’s take a coin. Every coin has two sides to it: heads and tails. Let’s slice a coin in half along its circumference so that we get two half-coins—one heads and the other tails. Let’s put each of these half-coins in a separate envelope. We will mail these two envelopes to two physics students, Alice and Bob. When Alice gets her envelope and opens it, she doesn’t need to call Bob to find out which half is in Bob’s envelope. If Alice received the half with heads, she knows that Bob received the half with tails and vice versa. Although it is a bit of oversimplification and quantum entanglement is more complicated than that, this metaphor helps students understand the main concept of entanglement—it is possible to find information about one object by learning about another object, without any communication between the two. I think every physics professor uses this example to explain to students the concept of entanglement. Perhaps, God was teaching Moses the concept of entanglement as well. Each of us is only half-coin or, rather, half-person. Together, we can form a whole. We are all equal in Gods eyes. And each of us is but a part of a whole. This concept finds its expression the Jewish law, halachah, in the principle Kol Yisrael arevim zeh bazeh, “all Jews are responsible for each other.” It is based on this principle one Jew can exempt another with fulfilling a commandment for both of them. For example, when I make Kiddush on Shabbat (sanctification of Shabbat over a glass of wine), all present at my table fulfill their obligation to sanctify Shabbat through me. Similarly, we all fulfill the commandment of blowing the shofar on Rosh HaShanah by listening to the baal tekiyah – the appointed person who blows the shofar for the whole congregation. We are all entangled. From another perspective, the lesson here is that the nation of Israel is entangled with God. Perhaps this is why the coin is called shekel hakodesh, the “holy coin.” This holy bond is inseparable. When we are entangled with God, nothing can harm us. This is why, perhaps, a half-coin offered by every Jew in the desert was meant to atone for them and save their lives. This was truly beautiful explanation, Mr. Poltorak! And a Jewish man needs to be married to escape being evil to do his tikkun in this life. We need ha Mashiah, to lead us into the messianic era to be able all together shine the Light of haTorah into the world.